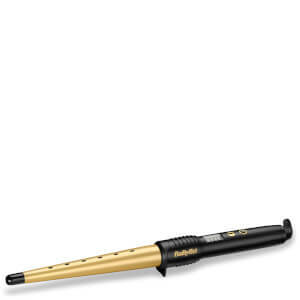 Create classical curls with a twist of attitude with the BaByliss Pro Dial a Heat Conical Wand. With its wide barrel starting at 32mm and tapering down to 19mm it gives you more flexibility and control to create the shapes you desire. 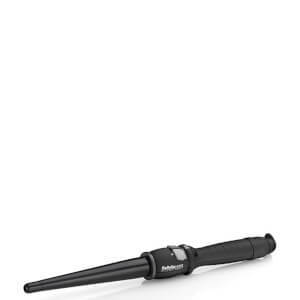 With 25 heat settings that you can alter throughout the curling process the BaByliss Pro Dial a Heat Conical Wand is the ultimate hair styling tool for creating classical curls full of bountiful bounce! This ultimate curling tool comes complete with a heat proof mat worth £9.99 to ensure that you style only your hair and not your surfaces. Also included are a pair of finger shields, a revolutionary idea to protect your skin whilst you style! 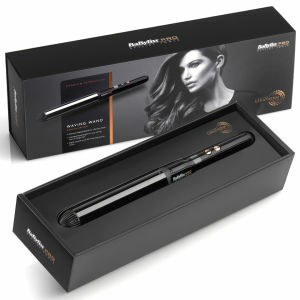 Additional features include it’s soft touch handle, which will protect you from the heat and minimise slipping, as well as a cool tip so that you can continually hold onto the wand whilst curling. There is also a swivel cord to avoid tangling whilst you are using your wand. 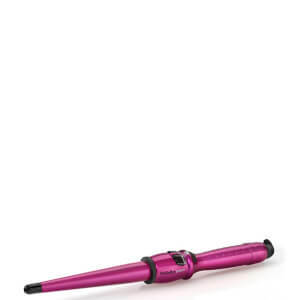 Starting from the widest end of your wand curling iron, wrap sections of your hair around the barrel. Supplied with a UK three pin plug only.